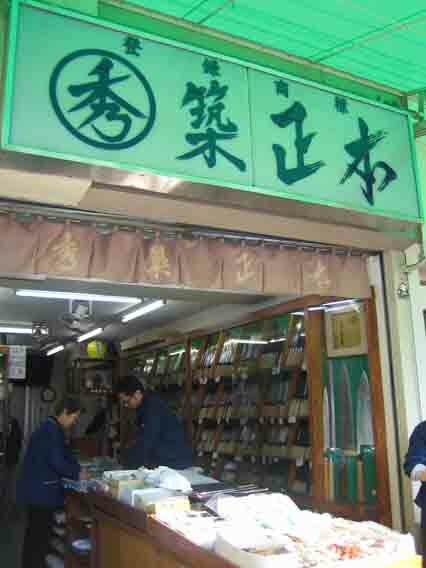 There are several knife shops in the market. Some of them are friendlier than others. Fifth generation Tsukiji Masamoto (opened in 1891) has always been on the friendly side and has an English speaking staff on some days. This is where my husband and I have purchased knives in the past and we love the service here. It’s a very busy shop with not only tourists, but also with the fishmongers from Tsukiji. Presdient Hirano-san in the photo below is there most days. The staff that work there are very knowledgeable about knives. Hirano-san has said that when the market moves to its new location at Toyosu that his shop will remain in place in the outer market. 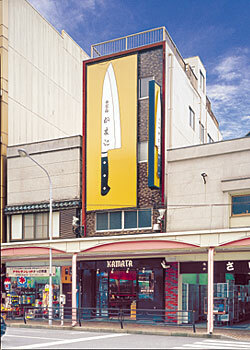 Kamata has a large selection of Western and Japanese knives, Japanese wet stones for keeping your knives sharp, and other kitchen gadgets. 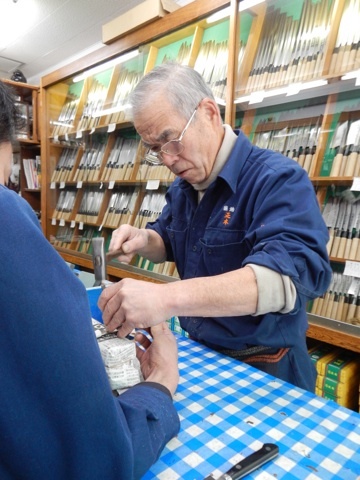 They will also sharpen your knives here if you live in Tokyo. Aritsugu has a much larger shop in Kyoto’s Nishiki Market. If you are going to Kyoto then you do not want to miss this store.